Flared lugs, 14k Gold filled and manual wind. This Longines cuts quite a dash today with it’s black dial and gold numerals. 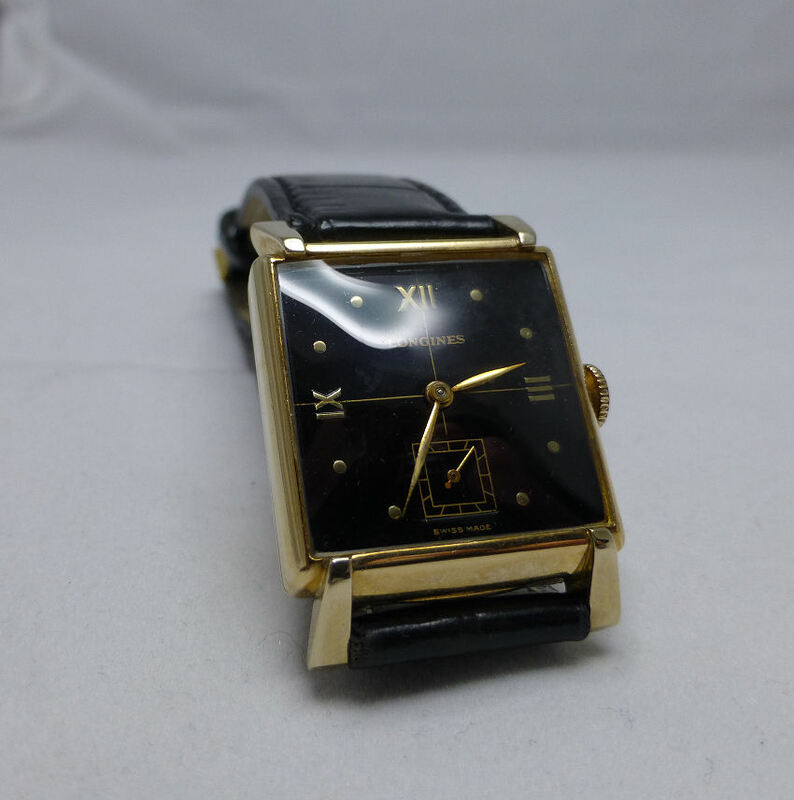 It has a subsidiary Seconds dial and elegant hour and minute hands and fully signed case, dial and movement. Note this model has what are termed “fancy” lugs. 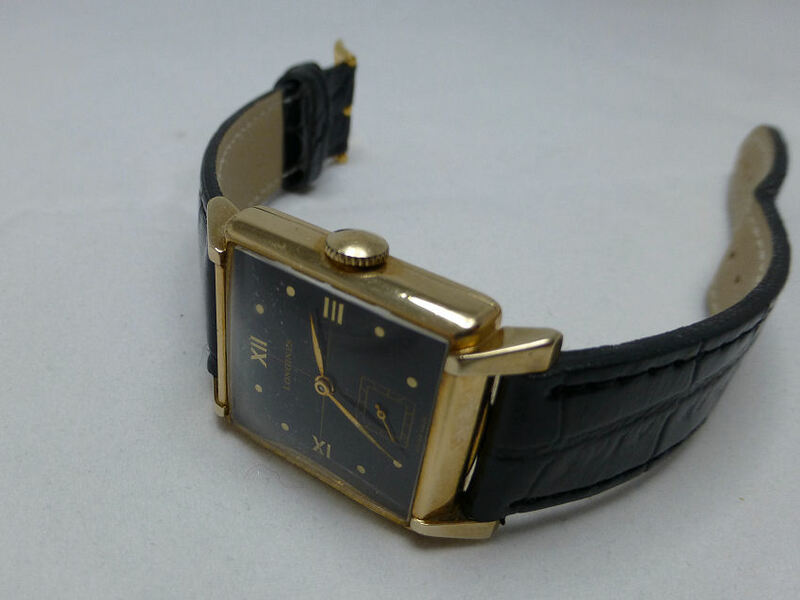 10K Gold Filled Longines Dress Gents – 1949/50 vintage. The movement is a Longines 17-jewel Cal. 10L, a decent workhorse of it’s day and has been around since 1949/50 and is in pretty good condition. No bad case marks or crystal scratches to be seen and it keeps very good time with a decent Power Reserve. Neat brushed gold finish with fancy lugs – classic. The nicely brushed gold finish to the back shows the quality and the fancy lugs lifts it a little bit above the usual. In short an elegant and subtly understated watch, which when worn today looks great, especially if you happen to be at a formal dress function. An absolute must, sophisticated and smart. The strap in this case is an after market affair, is good enough and compliments the watch generally and is a good fit. Not much more to say other than this was an Auction find and for what it is would appear to be a bit of a bargain find and certainly worth the paltry bid I offered to secure it – OR IT SHOULD BE . . .
Understated elegance even for today’s tastes. Note the case, dial and movement are each signed Longines. The watch overall is a nice size at 25mm x 28mm, but looks slightly larger on the wrist as it sits so well. Note the fancy lugs are fixed and the strap fixing is standard, so very easy to change. This model’s case is what is called Gold Filled – as opposed to the more often seen Gold Plated. Gold Filled is much superior to Gold plating, essentially as it is to a Standard. Which says for example that a 14K GF must contain 5% of Gold by weight, unlike plating which may only have somewhere around 0.05%. 14K = 14/20 Gold Filled ratio. Also as it is actually the application of one, two or even three layers of Gold, it is viewed as a true alternative to solid Gold. The layer or layers are then pressure molded to the base metal of the watch, such as brass. This particular process means that Gold Filled cases can last a lifetime and don’t easily rub off like Gold Plating often does. 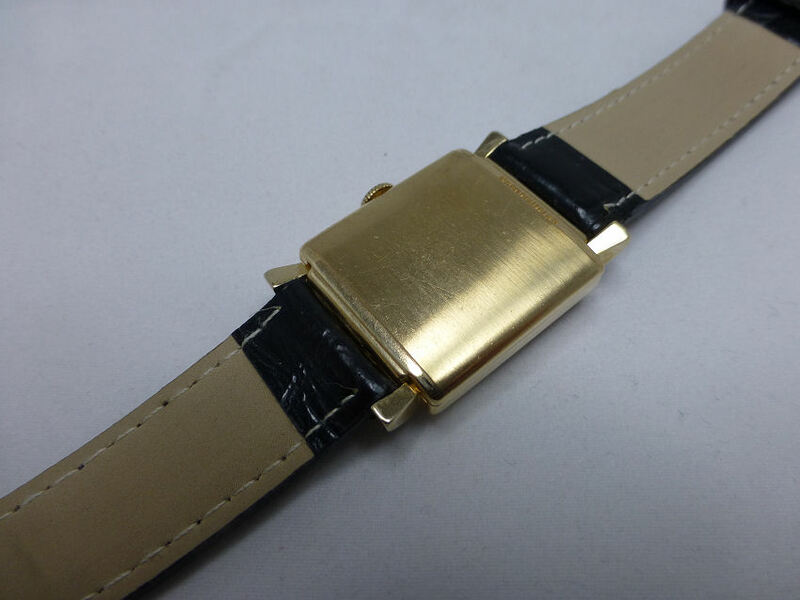 So always worth it to check what Gold system has been applied on any vintage watch and with 10K or 14K Gold Filled (GF), you won’t go far wrong. As to the which actual Longines Model this is, I have to confess I’m unsure, as there were so many over than period. It looks similar to a “Buchanan” but has Roman numerals and Dot markers and a black face. The Buchanan model had the dot markers but regular numbers and a white face and the lugs were not fancy as this one. The watch date is pretty close as the serial number can be reasonable accurate as a guide. But is there another reason why the model is not that easy to find? On closer examination (initially by a Watch Forum colleague after checking my close up photographs) this dial does not appear to be totally original. It is what’s loosely called a “re-dial”, where perhaps because the original dial was in such poor condition as a result of damp or damage etc. it was at some point in it’s life – repainted. The heavy black paint (unusual for a start with Longines) covers over the offending imperfection/s, the markers and numerals may be cleaned up or replaced, the hands re-painted or replaced and any printing re-applied. The problem with any re-dial however is how well it is managed. And in this particular case – it’s really not that good. As my colleague informed me – check out the chronometer cross (the main crossed lines of the dial) – these are NOT straight. The horizontal line does not go through the centre of the IX (9) or the III (3) at the other side. One is slightly low, the other slightly high. These would be absolutely straight on the original dial (this is careless work). Also looking closely, the subsidiary Seconds dial perimeter is misaligned even within it’s dial depression – it’s low on the right, so this again was carelessly printed. Also the hands have had some repainting too and though common on old watches is not very good here. 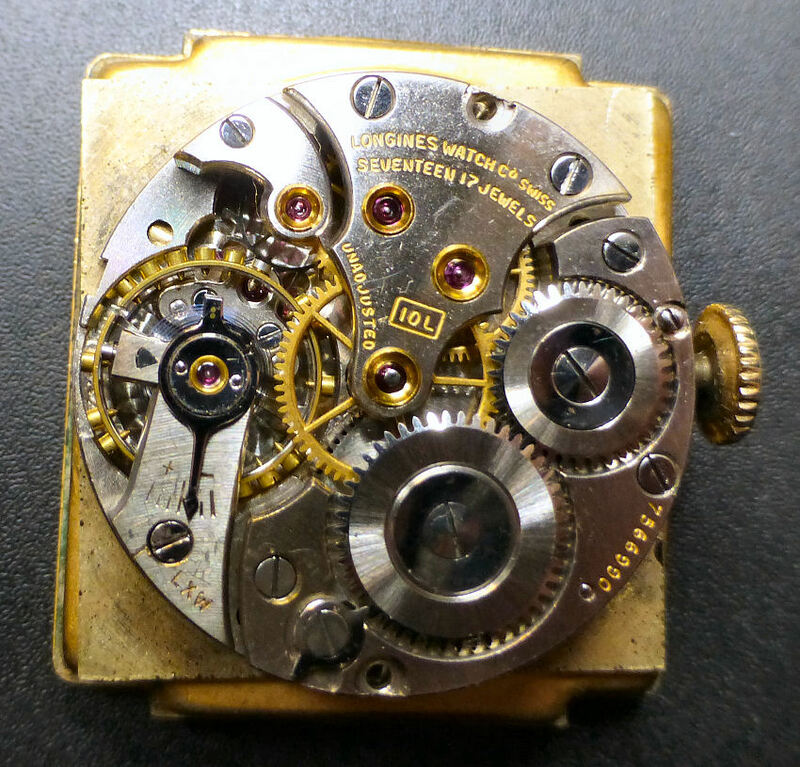 So all in all and I agree this is a re-dial and not the best, which is a shame as the rest of the watch, case and movement are perfectly right and in decent condition. So a tale of caution when you are bidding on an Auction but not present at the Auction – REMOTE BUYER – BEWARE! It is ALWAYS a risk buying from poor photographs. Note – The Auction House condition report noted the painted hands and suggestion of a re-dial at some stage of it’s life. So as always with remote purchases, there is an element of risk in not having a detailed and close up examination. As always – buyer beware! And am I happy with my purchase? 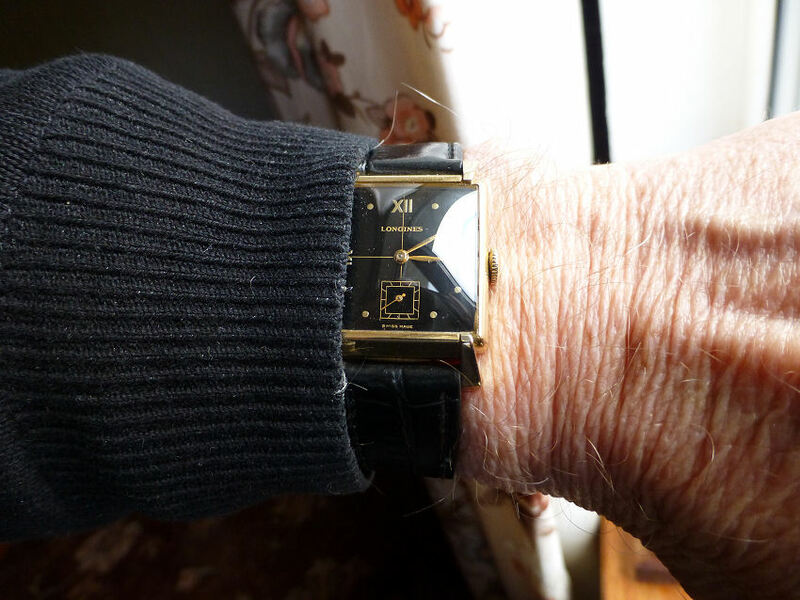 Well I have to say yes – it wasn’t expensive and I like it and OK it’s not perfect, but it works perfectly . . . . and it looks good on the wrist. 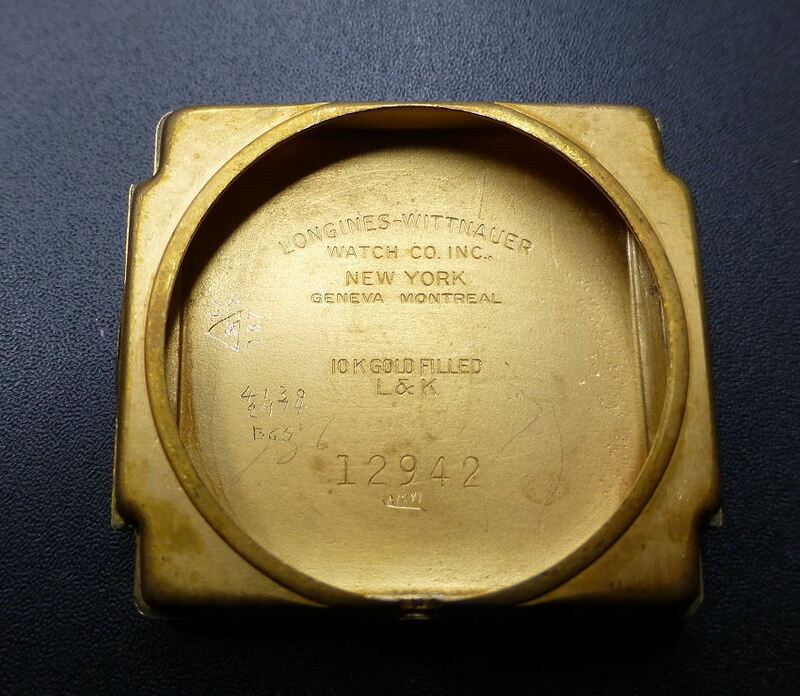 This entry was posted in vintage and tagged Gold Filled (GF), Longines Cal.10L, Longines vintage 1950. Bookmark the permalink. ← Now you see it, now you don’t!